61053 GRIP 3 pc Leather Punch/Grommet Tool Kit with 100 pc Grommets Description Use for punching holes in laminated documents, thick paper, jewelry making, crafts, repairing shoes, belts, garments and more. Leather hole punch has rotating head with punch sizes of 2.5mm, 3mm, 3.5mm, 4mm, 4.5mm, 5mm. Drop forged, heat treated steel handles with textured finish for a secure hold. 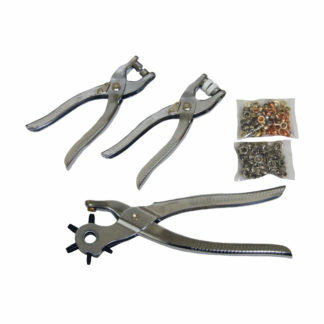 Includes – 1 pc leather hole punch, 2 pc grommet setting pliers, 100 pc shoe or belt grommets, and 100 pc button snaps.